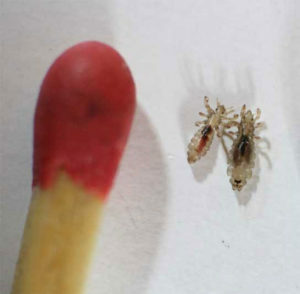 Head lice shown next to a match. It’s back-to-school season and Iowa parents have something new to worry about: super lice. Iowa is among the Midwestern states where the creepy-crawlers are being found. Jennifer Stiles, a disease prevention nurse at the Cerro Gordo County Department of Public Health in Mason City, says the lice have mutated and are tough to kill. Stiles says, “These super lice are resistant to the typical medications that are used, the over-the-counter medications, that are used for lice.” Stiles says the most important thing for parents to do — whether it’s lice or super lice — is to comb the child’s hair daily with a lice comb and use over-the-counter treatments twice. She says each lice kit has shampoo and a brush and a little comb in it, and combing the hair for 10-15 minutes every day to get those nits and any active bugs out is the most effective way of getting rid of lice. Stiles says if you spot your child itching his or her head a lot, that’s a big clue. Stiles says if over-the-counter treatments don’t work, seek professional help.